This frontispiece of Fray Gaspar de San Agustín’s Conquistas de las Islas Philipinas (1698) is an allegory of the relationship between the colonial State and Church in the Philippines. 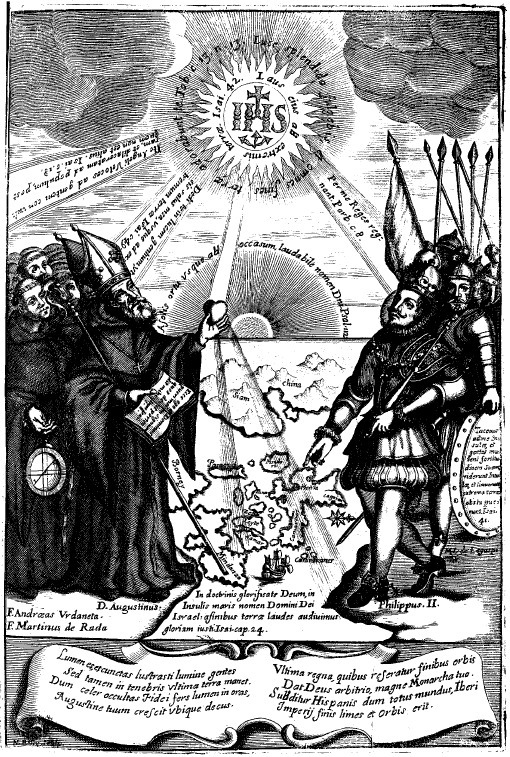 King Philip II of Spain (right) is seen pointing to the Philippine islands, while St Augustine (left), the founder of the Augustinian order, offers his heart, the usual iconographic symbol for this saint, to illuminate the archipelago through divine light, as symbolized by the Christogram above. Behind the saint are Fray Andrés de Urdaneta and Fray Martín de Rada, the first Augustinians in the Philippines. The pastoral visit of Pope Francis to the Philippines in January 2015, which gathered the biggest crowd ever assembled for a Papal event in history, has put to fore the nexus between translation and religion in this Southeast Asian archipelago. During his many engagements, the Pontiff delivered off-the-cuff homilies in his native Spanish, which were then translated into English by Monsignor Mark Miles of the Vatican Secretariat of State. There were also some instances—such as when the Pope had lunch with victims of typhoon Yolanda (Haiyan) in Leyte, or when he spoke with two former street children during a catechesis at the University of Santo Tomas—that even required that interpretation be done into Filipino, with Manila archbishop Luis Antonio Cardinal Tagle stepping in to provide some help. The role that translation played in the recent Papal visit is indicative of the history of evangelization and colonization of this overwhelmingly Catholic nation. Christianity was introduced into the country by Catholic missionaries, who began arriving in the 16th century as members of expeditions financed by the Spanish Crown. Although the Philippines proved to be a profitless enterprise, it was retained for more than three centuries as a strategic colonial outpost in the Pacific and as a springboard for the evangelization of other Asian nations, most notably China and Japan (Kamen 2002, 203, Phelan 1959, 14). A corollary to the establishment of Spanish settlements in the archipelago was the repartition of its many ethnolinguistic groups as objects of Catholic mission among various religious orders present there (Sueiro Justel 2007, 51). Given that Spanish migration into the country remained scant throughout the colonial period, the priests were the closest contact many Filipinos had with Spain (Ridruejo 2003, 181). Beyond the spiritual exigencies of their ministry, the priests were likewise tasked to perform civic and temporal duties, and were regarded as a complete arsenal of both Empire and Church. This view was best summed up in a 1765 missive that the Viceroy of New Spain reportedly sent to Charles III: “En cada fraile que pise el suelo filipino, V[uestra] M[ajestad] tiene un capitán general y un ejército” (Anonymous 1898, 39). [i] One important consequence of this symbiotic relationship between the colonial State and Church—which was so deftly allegorized in the frontispiece of Fray Gaspar de San Agustín’s history—was that in order to carry out their mission to spread the Catholic faith, the priests pioneered an extensive and systematic textualization of local knowledges through the publication of the first grammars, dictionaries and other similar texts on and in the indigenous languages. Sueiro Justel (171) notes that by 1898 there were about 124 grammars and 108 references to vocabularies of Philippine languages, which in absolute terms constituted an achievement that was similar to, if not greater than, that of Latin America. It was in this context that the Arte y reglas de la lengua tagala, the oldest extant grammar of Tagalog, came into being. Title page of the first edition of Arte y reglas de la lengua tagala (1610). The book was printed on papel de China or rice paper measuring 14 x 20 cms (Quilis 1997, 29). From the collection of the Biblioteca Digital Hispánica of the Biblioteca Nacional de España. Published in 1610 in the province of Bataan some 116 kilometers northwest of the capital city of Manila, the Arte was considered by the missionaries as the most authoritative colonial grammar of Tagalog, one of the major languages in the island of Luzon, and was often recommended as a supplement to other grammars printed subsequently. Its author, the Dominican friar Francisco Blancas de San José, a native of Tarazona, Spain who arrived in the Philippines in 1595 (Aduarte 1693, 403-413, Ocio 1895, 25-26), was described in Philippine missionary writings as the Achilles (San Agustín 1787 , n.p. ), Demosthenes (Noceda and Sanlúcar 1832 , n.p. ), and Cicero (Totanés 1745, n.p.) of the Tagalog language. 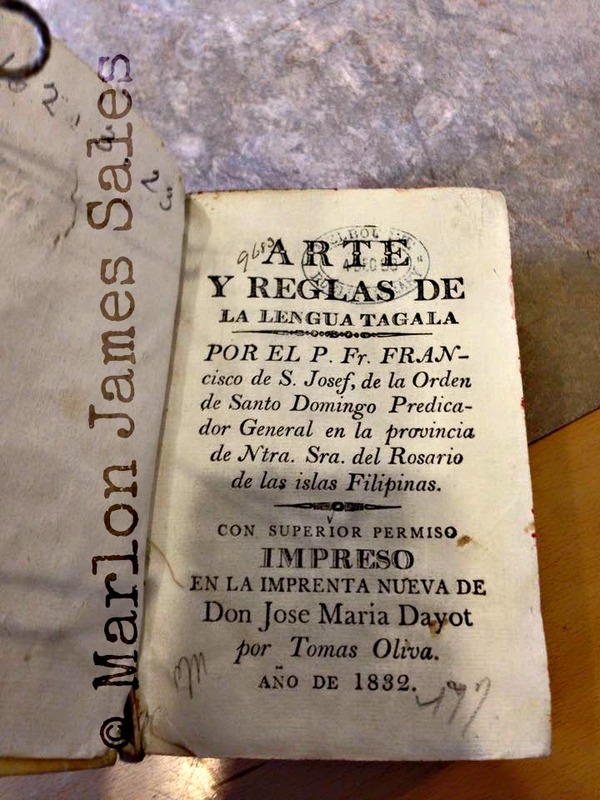 His Arte proved to be so important a resource that the University of San Tomas in Manila printed a second edition in 1752, while a third edition, printed by José María Dayot, came out in 1832 (Quilis 1997, 31-32). In the course of my PhD research at Monash University, I have discovered that the State Library of Victoria houses what seems to be the only extant copy of the Arte on Australian soil. As far as I know, this copy has never been included in previous catalogues of Philippine missionary linguistics. Even though the book appears at first glance as a mere grammatical treatise that compared Tagalog to Latin through Castilian Spanish as a metalanguage, an approach that was, by and large, the accepted mode of grammatization during the colonial period (cf., Auroux 1994, Esparza Torres 2007, Rafael 1993), we also find in Arte an early formulation of a theory of translation that emplaced the Tagalog people and their language into the grand narrative of Christian redemption. A common trope in missionary grammars was to imagine linguistic diversity as a defect incurred at the Tower of Babel (Barnstone 1993, 43). As such, it was not uncommon for missionaries to refer to linguistic diversity as a corruption of an original and unitary state of grace. Jesuit historian Francisco Colín, for example, wrote that, “se oluida la lengua común, y cada vno queda con la suya tan corrompida”[ii] (1663, 57). Franciscan grammarian Sebastián de Totanés, on the other hand, dismissed indigenous modes of speech as uncivilized, and even added that the Tagalogs were “toscos, zafios y de poca reflexión”. [iii] These views call to mind Antonio de Nebrija’s take on the transcendence of reducing a language to grammatical rules “para que lo que agora et de aqui adelante en él se escriviere pueda quedar en un tenor, et estender se en toda la duración de los tiempos que están por venir…”[iv] (Quilis 1980, 100-101). Missionaries regarded themselves as mediators between God and the colony, who by virtue of the gift of tongues dispensed to the Apostles on Pentecost, were equally empowered to convey God’s truth in a multitude of languages (Rafael 1993, 31). “Lengua de fuego os pido,” the Dominican prayed at the beginning of his Arte in allusion to the Holy Spirit that the Apostles received on that fateful day, “con q̃ abrasado mi pecho, se enciendan los oyentes con vuestro amor.”[vi] Blancas located the labors of the missionary grammarian in the interstitial niche between the divine and the colony. The gift of language must be granted to him first, the grammarian ensconced in that colonial in-betweenness, before the Christian doctrine could reach the colonized Filipinos, whom he described as gullible and weak of heart. In the course of my research, I found a copy of the third edition of Blancas’ Arte at the State Library of Victoria in Melbourne. As far as I can tell, this copy is unaccounted for in the bibliographies on Philippine missionary linguistics. Along these lines, translationality in the grammatization of languages was imagined as a search for divine meanings. Blancas spoke of a certain divinorum sensuum maiestatem as an operative term in the publication of a grammar. The concept, which was borrowed from St Jerome’s epistle to Hedibia and was acknowledged by the author in the marginalia, differentiated linguistic competence from translational competence. Not all preachers were blessed with the gift of tongue, according to the commentary of Cardinal Tommaso de Vio Cajetan on the promise of language to the early Church, which Blancas cited in his exhortation to ministers. In Cajetan’s view, the “discovery” of what was thought of then as the uncharted regions of the world belied the prodigiousness of Pentecost (“Experimento enim apparet Ecclesiam lingua, vel linguis carere multarum gentium temporibus istis repertarum…”). The new reality of colonial expansion led some ministers of the Gospel to rely on translators (“interpretes”) in the performance of their mission. St Paul himself, Blancas continued, was not capable of speaking Greek in a way that was worthy of the majesty of divine meanings (“diuinorum sensuum maiestatem, digno non poterat græci eloquii explicare sermone”), even though he certainly possessed the gift of tongues and had a command of the Scriptures. It was for this reason that the Apostle of the Gentiles had to rely on St Titus for interpretation (“Habebat ergo Titum interpretem”), and St Titus acted as his mouth in preaching the Gospel (“Ergo et Paulus Apostolus contristatur, quia prædicationis suæ in præsentirum fistulam organum que per quod Christo caneret non inuenerat”). Blancas emphasized that translational competence was contingent upon one’s familiarity with a particular textual typology and semantic field. Basing his explanation on a passage from the Summa theologica of St Thomas Aquinas, the Dominican missionary wrote that the linguistic knowledge that permitted his brothers in the cloth to preach on matters of faith was not necessarily sufficient to allow them to study the ‘acquired sciences’, such as arithmetic and geometry (“non autem quantum ad omnia quæ per scientiam acquisitam cognoscuntur; puta de conclusionibus Arithmeticæ vel Geometriæ”). In other words, while language was ideated as a numinous gift, the extent to which it could be utilized outside the realm of religion depended on other considerations. Language was thought of as an instrument to gain understanding of other fields of knowledge, a view that echoed the humanist traditions in Europe (Sánchez Salor 2002, 293, 297-298, Ynduráin 1994, 74, 202). Grammar was both translatus and translatio: it was both the product and the process of transfer. 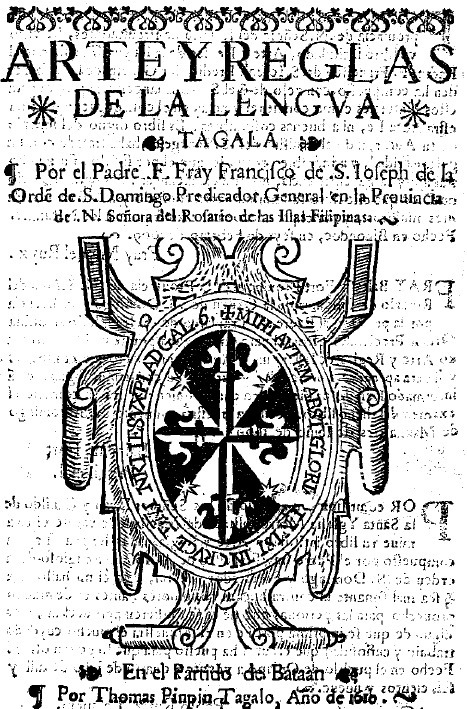 The foregoing discussion on Fray Francisco Blancas de San José’s Arte y reglas de la lengua tagala provides a preamble on a bigger research project that I am completing for my dissertation. 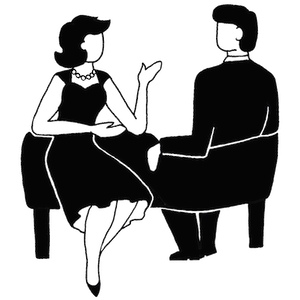 The next stages of my investigation will look into specific examples of translationality and the establishment of a schematic equivalent effect by emplotting linguistic knowledge into a Christian(ized) discourse. That, I guess, will be for another post. [i] ‘In each friar who steps on Philippine soil, Your Majesty has a captain general and an army.’ All translations from Spanish are mine. Aduarte, Diego de. 1693. Historia de la provincia del Sancto Rosario de Filipinas, Iapon, y China de la sagrada Orden de Predicadores. Zaragoza: Domingo Gascón. Anonymous. 1898. Los frailes filipinos. Madrid: Imprenta de la viuda de M. Minuesa de los Ríos. Auroux, Sylvain. 1994. La révolution technologique de la grammatisation: Introduction à l’histoire des sciences du langage, Philosophie et langage. Liège: Mardaga. Barnstone, Willis. 1993. The poetics of translation : history, theory, practice. New Haven; London: Yale University Press. Blancas de San José, Francisco. 1610. Arte y reglas de la lengva tagala. Bataan: Tomás Pinpin [typesetter]. Blancas de San José, Francisco. 1832 . Memorial de la vida Christiana en lengua tagala [Librong mahal na ang ngala’y Memorial de la Vida Christiana]. 2nd ed. Manila(? ): Imprenta de José Mª Dayot, Tomás Oliva [typesetter]. Esparza Torres, Miguel Angel. 2007. “Nebrija y los modelos de los misioneros lingüistas del náhuatl.” In Missionary Linguistics III/ Lingüística Misionera III: Morphology and Syntax-Selected papers from the Third and Fourth International Conference on Missionary Linguistics, edited by Otto Zwartjes, Gregory James and Emilio Ridruejo, 3-40. Amsterdam and Philadelphia: John Benjamins Publishing Company. Kamen, Henry Arthur Francis. 2002. Spain’s road to empire : the making of a world power, 1492-1763. London: Allen Lane. Mühlhäusler, Peter. 1996. Linguistic ecology : language change and linguistic imperialism in the Pacific region. London, New York: Routledge. Noceda, Juan de, and Pedro de Sanlúcar. 1832 . Vocabulario de la lengua tagala. 2nd ed. Valladolid: Higinio Roldán. Ocio, Hilario María. 1895. Compendio de la reseña biográfica de los religiosos de la provincia del Santisimo Rosario de Filipinas desde su fundacion hasta nuestros dias. Manila: (Estab. Tip. del Real Colegio de Sto. Tomas). Phelan, John Leddy. 1959. The Hispanization of the Philippines : Spanish aims and Filipino responses, 1565-1700. Madison: University of Wisconsin Press. Quilis, Antonio. 1980. Antonio de Nebrija, Gramática de la lengua castellana. Madrid: Editora Nacional. Quilis, Antonio. 1997. Fray Francisco Blancas de San José, Arte y reglas de la lengua tagala. Estudio y edición. Madrid: Ediciones de Cultura Hispánica-AECI. Rafael, Vicente L. 1993. Contracting colonialism : translation and Christian conversion in Tagalog society under early Spanish rule. Durham and London: Duke University Press. Ridruejo, Emilio. 2003. “La primitiva tradición gramatical sobre el pampango.” In Missionary Linguistics/Lingüística misionera-Selected papers from the First International Conference on Missionary Linguistics, edited by Otto Zwartjes and Even Hovdhaugen, 179-200. Amsterdam/Philadelphia: John Benjamins Publishing Company. San Agustín, Gaspar de. 1787 . Compendio de la arte de la Lengua Tagala. 2nd ed. Manila: Convento de Nra. Sra. de Loreto. Sánchez Salor, Eustaquio. 2002. De las “elegancias” a las “causas” de la lengua : retórica y gramática del humanismo. Alcañiz-Madrid: Ediciones del Laberinto. Sueiro Justel, Joaquín. 2007. Historia de la lingüística española en Filipinas (1580-1898). 2nd ed. Lugo: Axac. Totanés, Sebastián de. 1745. Arte de la lengua tagala, y manual tagalog, para la administracion de los santos sacramentos. Sampaloc, Manila: Convento de Nra. Sra. de Loreto. Ynduráin, Domingo. 1994. Humanismo y renacimiento en España. Madrid: Cátedra.